Arabs have lived in Africa since at least the A.D. 600s, when people from the Arabian peninsula conquered EGYPT and LIBYA. Arabs eventually controlled much of North Africa. Arab culture—including the Arabic language and the practice of Islam—has been so widely adopted that Egypt, Libya, ALGERIA, TUNISIA, and MOROCCO are now considered to be part of the Arab world. Other regions of Africa have also been influenced by contacts with Arab culture, primarily through trade. In 640 an Arab force invaded Egypt, then part of the Byzantine Empire (the eastern portion of the Roman Empire). From Egypt, various Arab generals moved to the west taking over the northwest African coast. This territory, known as the MAGHREB, was inhabited by the BERBERS, who surrendered in large numbers to the invaders and adopted Islam. By 705 the Maghreb had become a province under the control of the Muslim Umayyad dynasty. As colonial rulers, the Arabs brought their religion, customs, and language to the region. Eastern Africa lies across the Red Sea from the Arabian peninsula, the birthplace of Islam and much of Arab culture. People and goods traveled between the two regions well before the rise of Islam in the 600s. ETHIOPIA was one of the first areas in eastern Africa to be influenced by Arab culture. By about A.D. 100, people from southern Arabia had reached Ethiopia by sea, bringing their language and their ability to build in stone. Trading relations between Arabs and the local people contributed to the emergence of the Aksumites, who founded the kingdom of AKSUM in the Ethiopian highlands. Ethiopians also crossed the Red Sea into southern Arabia. By the 900s many peoples along the coast of SOMALIA and the interior lowlands had converted to Islam, and a number of Islamic states had been established. These states controlled trade in the region and posed a threat to the Christian communities that had developed in Ethiopia. To the west of Ethiopia, NUBIA (in present-day SUDAN) consisted of a number of Christian kingdoms. By the 1300s these kingdoms had fallen to Muslims from Egypt. Their defeat increased the threat of a Muslim invasion of the Christian state of Ethiopia. Migrating Arabs intermarried with the people of Nubia and introduced the Arabic language and the practice of Islam, both of which spread rapidly throughout much of the southern Nile valley. In modern times, Arab Muslims have supported the secession of ERITREA from Ethiopia. To counter the Muslim pressure, Ethiopia has sought other allies, including the nation of Israel. Meanwhile, Muslim groups in Sudan have tried to make the country entirely Muslim and Arab. This effort has led to periodic outbreaks of genocide against the non-Muslims in southern Sudan by Arabs wishing to take their land and control its oil resources. Known to the ancient Arabs as the land of Zanj, the Swahili coast runs from present-day Somalia to MOZAMBIQUE. Easily reached by sea from southern Arabia, this region was an ideal location for trade between Africans and Arabs even before the rise of Islam. Later, Arab merchants settled in the area’s growing city-states, such as Mombasa and Kilwa. By A.D. 900 the eastern African coast had emerged as a prosperous commercial center. Islam became a major force along the Swahili coast. By adapting to local traditions, the religion gained new followers. Some people converted to Islam because it opened up opportunities for commerce and social advancement. The blending of Arab and African traditions in this region also led to the emergence in the 1000s and 1100s of the Swahili civilization. After reaching a peak in the 1200s and 1300s, this civilization declined when the region was colonized by people from Portugal and from Oman on the Arabian peninsula. Trade, intermarriage, and shared religious beliefs shaped the relations between Arabs in North Africa and the peoples of western Africa. Although western Africa never experienced significant Arab migration, Islamic religion and culture took hold and spread in the region. Islamic traditions coexisted with local customs and beliefs. In many West African kingdoms, educated Muslims played key roles in administration and diplomacy. The work of Islamic scholars from the Niger River region (in present-day MALI) became famous throughout the Muslim world. In the mid-1700s a strict Islamic religious movement swept through much of western Africa. When Europeans arrived in Africa, they were faced with this intense religious culture, and it influenced their policies during the colonial period. Arab influence is still very strong in parts of MAURITANIA, Mali, NIGER, and CHAD. In these lands, as well as in other parts of Africa, Arab culture is admired; as a result, many people claim to have Arab ancestors. Contact between Arabs and Africans south of the Sahara desert—including trade and migration— decreased during the colonial period. The policies of the European colonial governments altered the ties that had existed between Africa and the Arab world. The Europeans replaced Islamic learning with Western education, substituted the Roman alphabet for the Arabic one in the writing of many African languages, and stressed Arab involvement in the African SLAVE TRADE. Although the struggle against European colonialism brought Arab and African leaders closer together, the connection between them was based on nationalism rather than on commerce or culture. In 1963 African and Arab resistance to colonialism led to the formation of the ORGANIZATION OF AFRICAN UNITY (OAU). The OAU played a significant role in strengthening relations between the two groups. Despite some suspicions and mistrust on both sides, African and Arab leaders managed to work together on matters of mutual interest, such as economic development. 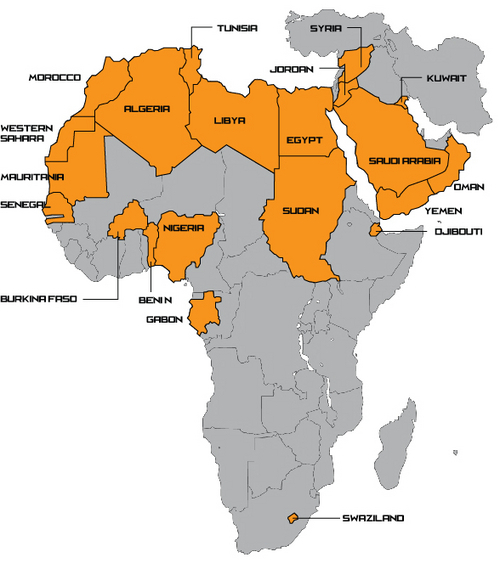 Numerous African nations, including Egypt, Libya, Sudan, Tunisia, Morocco, Algeria, Mauritania, Somalia, and DJIBOUTI also joined the Arab League, a regional organization of Arab states. In 1967 many of the nations of sub-Saharan Africa supported Egypt in the Suez Canal war against Israel. However, some more recent conflicts in Africa—such as a civil war in Chad—have strained Afro-Arab relations by dividing Arabs and Arabic-speaking or Muslim Africans. Intervention in African affairs by Arab leaders such as Muammar al-QADDAFI of Libya has also frightened some African leaders and persuaded them to seek help from the West to counter Arab power.